This game has a Command Battle, turn-based system where you charge, then perform actions. During the beginning of a turn, your AP and SP will be charged. You can perform actions until you run out of the necessary cost required for them, and you can end your turn at any desired time. Displays the current turn order of allies and enemies. The character to the furthest left is currently awaiting commands, or the one currently executing commands. Displays the status of all party members currently participating in battle. (Hit Points) This number will lower by the amount of damage taken from enemy attacks and the like. When it becomes "0", the character will be KO'd. (Special Points) Required in order to execute special skills. （Action Points） Required to execute any and all skills. 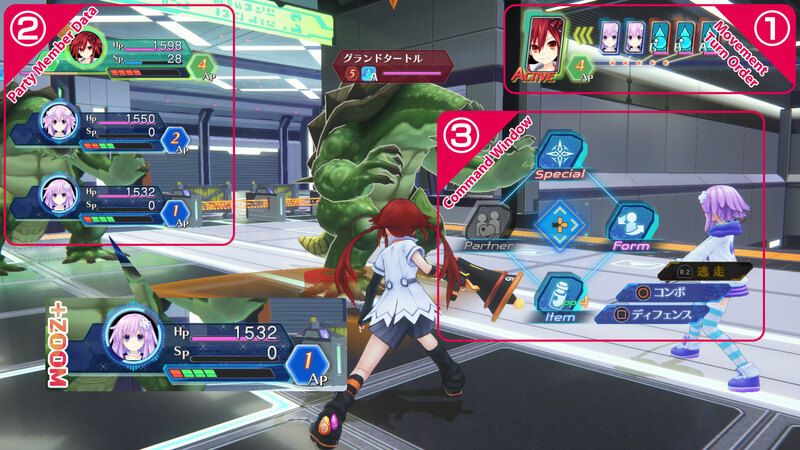 directional buttons You can select from "Special Skills," "Form Skills," "Item Skills," and "Partner Skills." x button You can select "Combo Skills." □ button You can select "Defense Skills." R2 button By selecting "Escape" when your character is adjacent to the outer rim of the battle field, you can escape from the battle. ※ You can only use "Escape" once per turn, but there is a chance that it will fail. By winning a battle, you can earn experience, Credits, and items as rewards. Ending a battle also heals all the statuses of each character. By removing the troublesome feature of healing during exploration, you can now enjoy each and every battle to their fullest. If you are defeated, then it will be a Game Over. You will restart the game from a checkpoint in such a case.